Robert Coleman, supervisory motor vehicle operator for VA Maryland Health Care System, oversees the introduction of five electric cars to the health care system's fleet. “The VA Maryland Health Care System is testing these cars that are capable of faster speeds and highway driving," says Regina M. Larrabee in the Office of Asset Enterprise Management’s Green Management Program Service. Propelled by an electric engine, the rubber is hitting the road in Maryland. The Department of Veterans Affairs (VA), including the VA Maryland Health Care System, and 20 other federal agencies nationwide are participating in a General Services Administration (GSA) pilot to test the efficacy of electric cars by incorporating them into the Federal fleet. More than 100 electric vehicles are being leased to agencies in Maryland, California, Michigan, and other locations. 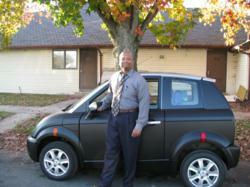 At the VA Maryland Health Care System, five Think City electric cars are replacing five petroleum fuel internal combustion engine vehicles, and they will be used like any other automobile to test their capabilities, says Robert Coleman, supervisory motor vehicle operator for the health care system. The cars’ performance will be evaluated using four criteria: performance, fuel savings, cost, and durability. A fully-charged electric car can run about 100 miles before it needs to be recharged and when it is depleted it takes about eight hours to recharge. To keep the cars charged, the VA installed five electric vehicle charging stations acquired by GSA. A veteran-owned company, Autoflex Inc, was contracted to install the charging stations - three at the Baltimore VA Medical Center and two at the Perry Point VA Medical Center. Coleman says a training program for employees is underway. “Although the controls of the electric cars look exactly like the controls of internal combustion engine cars, when you stop the car, say at a red light, it sounds like it is not running. That will take some getting used to,” he says. Coleman also indicates that the upkeep and maintenance of the electric cars remains an unknown. “The cars lack a tail pipe necessary on the internal combustion engine vehicles, but they operate on two battery systems, one for the lights, radio and components, and the other for the car itself,” says Coleman. “It seems doable that a half-charged car will be able to travel from Perry Point to Baltimore and then be left to charge while the commuter attends meetings or conducts other business for a few hours before having to make the return trip,” says Coleman. On a recent test drive between the two medical centers, the electric car used 60 percent of its battery power, and Coleman says, “it didn’t feel any different than an internal combustion car. The day was cold, rainy, windy—perfect for a test drive. I kept the windshield wipers and window defroster on for the entire trip. When employees who are commuting to and from the two medical centers indicate that their stay at either the Baltimore or Perry Point VA Medical Centers is less than two hours, Coleman plans to have a fresh car ready for their return trip. “If the car uses 60 percent of the battery power one way, charging it for only two hours will not give the car enough power for the return trip,” he says. To acquire the cars, GSA issued the first open, competitive solicitation to request bids from all electric car vendors that could offer cars that meet Federal Vehicle Standards and comply with applicable regulatory requirements. Contracts were awarded for Chevrolet, Nissan and Think City vehicles. Since that initial award, GSA has added additional emerging technology vehicles that are available to agencies like the VA. “The Veterans Integrated Service Network 5, which covers the Washington, DC, Maryland and West Virginia areas, received five Think City electric cars because their facilities seemed like a good location to participate in the pilot,” says Regina M. Larrabee in the Office of Asset Enterprise Management’s Green Management Program Service. “The VA Maryland Health Care System is testing these cars that are capable of faster speeds and highway driving. The older types of electric vehicle are golf cart type vehicles used only for short trips in shorter distances and aren’t generally approved for use on public roads,” she says. Last year, GSA doubled the number of hybrid cars in the Federal fleet as part of the effort to develop practices that would lead to 100 percent alternative fuel passenger vehicles and light-duty trucks by 2015. “Diversifying our transportation fleet with hybrids, electric vehicles and other alternative fuel vehicles is critical to the President’s long-term plan to break our dependence on foreign oil and invest in our nation’s growing clean energy economy, and this pilot is part of that process,” she says.